Jesse Morgan left to fight in the Civil War as a man who used his looks and his charm to get what he wanted. He came back to hide from the world in Rocky Ridge with an injury that makes it difficult to do more than look after his own basic needs. Dr. Grace Leonard has never let the word â€œnoâ€ stop her from going after what she wants. Since graduating from the medical college back east, sheâ€™s come home in Rocky Ridge to work alongside her father. Grace sees the real man behind Jesseâ€™s bitter exterior, a man she grows to love. Sheâ€™s convinced new techniques sheâ€™s learned can help him recover, if she can persuade him to try. 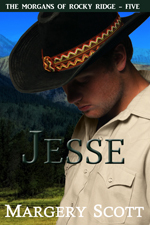 Jesse is drawn to Grace more than any other woman heâ€™s ever known. He admires her intelligence and her hard work, not to mention how she makes him want more than he can have. But she deserves a man whoâ€™s whole and who can provide for her. He canâ€™t, and likely wonâ€™t ever be able to. Can Grace help Jesse heal, both his body and his heart? And can Jesse allow himself to look forward to the future again? Â Â Â Â Â Jesse Morgan looked at the milking stool and swore. Loudly. How the hell was he supposed to get himself onto that stool to milk the cow? Â Â Â Â Â He tightened his grip on his cane and gritted his teeth against the fire shooting through his leg as he crossed the barn, every step more painful than the last. He should be used to it by now. He knew that. It had been almost a year since the cannonball had exploded near him at the Battle of Trading Post, shattering his knee and tearing up the muscles in his leg. The surgeon had wanted to amputate, and had warned Jesse that even if he didnâ€™t die from infection, heâ€™d be in pain for the rest of his life. Jesse had refused, willing to die rather than be less than whole. Â Â Â Â Â An infection almost did kill him. Heâ€™d survived, but he was still far from being the man heâ€™d once been. And now he knew the truth. Heâ€™d never be that man again. And the frustration at not being able to do the things he used to do was even worse than the pain. Â Â Â Â Â His old life was gone. Adventure, laughter, women â€¦ they were all gone. Â Â Â Â Â And now, somehow, he had to figure out how to milk the damn cow. His pa had run their small spread a few miles outside Rocky Ridge since he and Jesseâ€™s brothers Heath, Will, and Brett, had all picked up stakes in Kansas and settled in Colorado. Â Â Â Â Â Jesse had been away fighting in the war at the time and since heâ€™d had no home left in Kansas, heâ€™d come here to recuperate after his injury. Â Â Â Â Â Heâ€™d moved into the one-room cabin at the edge of the ranch, and kept to himself as much as he could. Heath brought him supplies from town, and once a week or so, he dragged himself to the main house to visit with his father. Â Â Â Â Â Until now, his pa and Heath had taken care of the ranch without him. But Heath was away â€“ Jesse wasnâ€™t really sure where he was or what he was doing â€“ and his pa had come down with the ague. Â Â Â Â Â Which meant Jesse had moved to the main house to run things until his pa was back on his feet. Â Â Â Â Â He almost laughed. As if he was capable of doing much more than looking at all the chores that needed to be done every day â€“ milking the blasted cow, getting hay out of the loft for the horses, cooking the meals, gathering the eggs. The list was endless. Â Â Â Â Â Sure, he could ask one of the hands to take over the chores, but heâ€™d rather chew glass. There was no way in hell heâ€™d give them any more reason to treat him like a cripple. Â Â Â Â Â No, somehow heâ€™d have to manage. Â Â Â Â Â Sucking in a deep breath, he leaned on his cane and clenched his teeth against the pain as he slowly made his way to where the cow was tethered. The cow looked up at him, her eyes huge, and let out a mournful sound. Â Â Â Â Â He picked up the milk bucket, then, leaning on the cane to keep his balance, leaned over to set the bucket under the cow. Fire speared his thigh as he bent his leg and he couldnâ€™t prevent the tortured groan that escaped. He swore again, louder this time, unable to hold in his frustration and rage. Â Â Â Â Â It took more than a minute to maneuver his body so that he could sit on the milking stool and by then, he was breathing hard and his forehead was covered with a sheen of perspiration. It took a few more minutes before he was ready to begin. His leg still hurt like hell, but he forced himself to ignore it. Â Â Â Â Â Ten minutes later, the pail was only a quarter full since heâ€™d had to stop every few seconds to adjust his leg. But heâ€™d get there â€“ and without asking for help from anybody. Â Â Â Â Â The man spun around to face her. His leg jerked, and his foot smacked into the bucket under the cow. The bucket toppled. Milk splashed out and the remainder streamed across the barn floor. Â Â Â Â Â His jaw clenched, and his knuckles whitened as he gripped the cane lying on the straw beside him and struggled to get to his feet. He stepped out of the shadows into a beam of light coming from outside. Â Â Â Â Â Grace knew it was impolite to stare, but she couldnâ€™t help herself. Even though his forehead was furrowed and his lips pressed together, he was still the most handsome man sheâ€™d ever seen. Â Â Â Â Â Not that she should be surprised. She knew most of the other Morgan men, and they had all been blessed with good looks, but something about Jesse did something very strange behind her ribs. Â Â Â Â Â â€œWhat do you want?â€ he asked. He leaned heavily on his cane as he took a few halting steps toward her. Â Â Â Â Â A slow smile creased his lips, and for a moment, it seemed as if his pain had disappeared. â€œWell, Iâ€™ll be,â€ he said, the sarcasm evident in his voice. â€œI thought Pa wanted me out here doing chores because he was too sick to do them himself, and all the time he just wanted me out of the way because he had a lady coming to â€¦ what was it you called it? Visiting?â€ His gaze raked over her as if she was a horse he was thinking of buying. Â Â Â Â Â Graceâ€™s face flamed. He thought â€¦ how dare he? Â Â Â Â Â His gaze rested on her face, now burning and flushed with both anger and â€¦ something she couldnâ€™t explain. Â Â Â Â Â â€œYou have now,â€ she said. There were still very few women doctors, and outside of cities, they were very rare. She supposed it was understandable heâ€™d assume she had other reasons for being here, but that was no excuse for rudeness. And to assume she was â€¦ she was mortified at the thought. Surely he could see by the way she was dressed that she wasnâ€™t a soiled dove. But perhaps painted ladies did dress more conservatively during daylight hours. Strange, she thought. Sheâ€™d never really noticed before. Â Â Â Â Â Jesse laughed, a deep chuckle that filled the barn. The sound sent a sensation through her that reminded her of bubbles bursting inside her veins. Â Â Â Â Â Grace couldnâ€™t help but smile. Heâ€™d described Buck Morgan exactly. Grace almost gasped at the sudden change in mood and the bitterness in his voice. This man was obviously in pain, both emotional as well as physical. Â Â Â Â Â Grace watched the expression on his face change. At least he had the good sense to look a little contrite. Â Â Â Â Â â€œYou know how to cook?â€ she couldnâ€™t help asking. Sheâ€™d never met a man who could manage more than brewing coffee. Â Â Â Â Â At the door of the barn, he half turned to face her. â€œUh â€¦ thanks for letting me know,â€ he said before he disappeared from view. Â Â Â Â Â Left standing in the barn, Grace glanced around. At that moment, the cow – Bessie, heâ€™d called her – mooed plaintively. Â Â Â Â Â A soft smile tugged at Graceâ€™s lips. What kind of man named his livestock, even his milk cow? Â Â Â Â Â Sheâ€™d seen Jesse struggle with the milking and knew the pain heâ€™d be in when he returned to finish the job. An idea hit her. She cast one last glance at the open barn door, then stripped off her gloves, set her reticule on a stool nearby, and picked up the milk bucket. Ten minutes later, she set a full pail of milk aside. Â Â Â Â Â She was tempted to wait for him, but decided against it. If her original estimation of Jesse Morgan was correct, he was not going to be happy about what sheâ€™d done when he returned.